The Whole Food Artists are a holistic catering team that create nourishing food using high-quality, organic and pure ingredients. 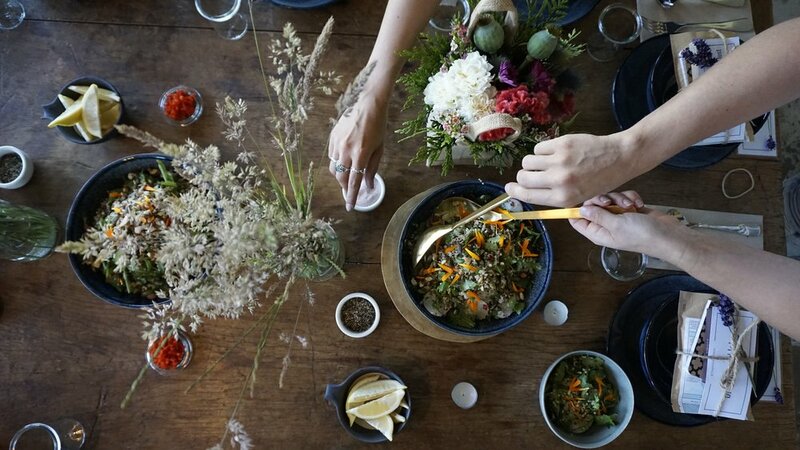 At The Whole Food Artists, we are humbly passionate about sharing the art of cooking wholesome, healthy and taste-full food on retreats and within workshops. With an emphasis on delivering delicious flavours, our dishes also nourish the body and the mind. We serve food that encourages a deeper sense of balance and vitality. With an understanding that each individual has unique needs, we cater to a wide variety of dietary preferences including vegetarian, vegan and meat-lovers too. All animal products we use are that of the ethical, sustainable and chemical-free kind and are organic wherever possible. We always endeavour to support local and small businesses in order to ensure that the produce we cook with has been grown using natural farming techniques and done so with integrity. With each step we take, we prioritise becoming more sustainable and earth-friendly. The kitchen is our creative space, and the dishes that we bring to life are our health-giving artworks.